The box beam shelf design and double-sided compression clips support loads up to 350 lbs. per shelf (evenly loaded). 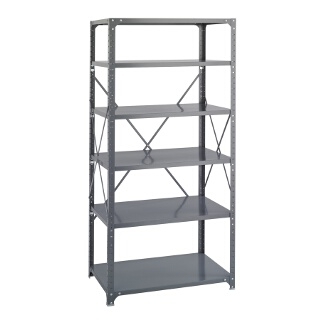 Shelves can be easily repositioned in one-inch increments. Post Kit includes four 75" high posts (must be ordered with each Shelf Pack). Durable Dark Gray finish. Assembly required.